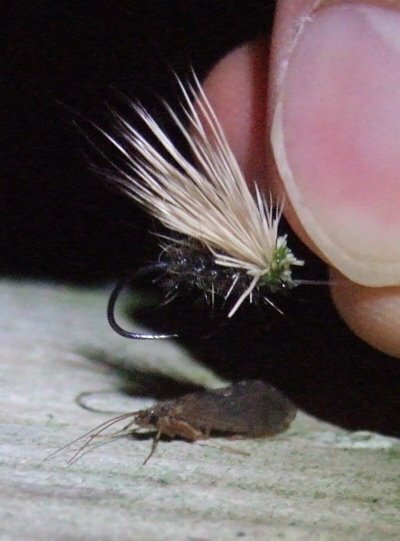 Tonight I was in the unusual situation of having fished my favourite river for the previous two evenings (those reports are on the way…) The fishing had gotten noticeably better between the first and second sessions, and my hopes began to dance ever more enthusiastically as I arrived to find BWO’s and sedges cavorting over the water. I rigged up a new fly, the CDC loopwing emerger. I tie this fly on a curved hook (Kamasan B100) and reckon it looks about as good as any emerger I’ve come across. It’s sits kind of like a DHE, but with better consistency. It also has a really nice, messy thorax which seems to suggest drowned wings and such mischief. After this evening’s festivities it will find a permanent place in a corner of my fly box. Up to the first pool, and after 10 minutes of watching a nice fish showed in a swirling run near the pool’s neck. Ten or fifteen fruitless casts followed before a final ‘chuck and chance’ presentation brought a lovely boil of a rise and one of the best trout I’ve had this season. Fighting fit and with the suggestion of a kype, he was a cracking way to start things off. After two or three more fish I switched to a big sedge. The red glow in the west started to fade to pale orange, and I started to comb through the runs. The mojo seems to be back, and it’s about time too. Fishing my new favourite rod, a 3 weight, I lost count of the wee fish and must have had half a dozen pretty nice ones. For seriously close range fishing like this a light rod is a real joy. Several of the fish were hooked less than a rod length away. I’m not sure I’d fancy the shotgun for such a situation.. The pinnacle of the evening came in a tiny little pocket pool. Multiple casts from different angles hadn’t produced anything, so just before moving up to the next pool I tried a final caress with the leader. 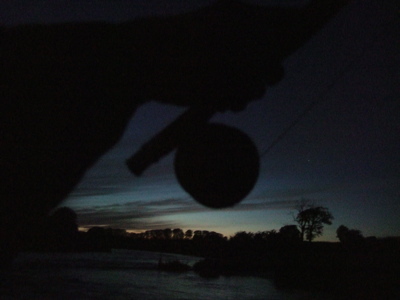 The rise was almost invisible in the gathering gloaming, but I set the hook and was immediately shocked by a powerful downstream run that ripped the spare line out of my left hand. I was almost at the point of feeling smug, a large smile firmly planted between my cheeks, when he jumped twice and threw the hook. It’s always nice when they do that, just to leave a tantalising glimpse of their size. He was a nice fish, maybe 2lb. I fished on up, catching here and there as sedges flittered around my head. Gradually things faded as I reached some particularly streamy water and worked my way back to the bank. My headtorch occasionally strayed down into the summer-clear water to reveal beautiful strokes of green streamer-weed. Little bubbles spun around as they carried a merry dance downstream, seemingly trying to join me in blissful contentment. This evening was particularly successful because I only came really close to a full dunking on one occasion. Sometimes I think it almost seems fitting to get a soaking, as if falling in the river brings you closer to the fish. Maybe. Or maybe I just felt so content that nothing could have ruined my evening. I love the way that the sound of a river becomes completely normal when you’re fishing. 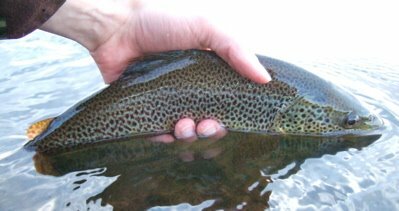 The cascading runs, the gentle smooching of the flats and the continuous trickle of the feeder burns. It’s a special kind of chorus afforded to the luckiest of men. This evening I only noticed the river’s song as I walked through the field away from the water. 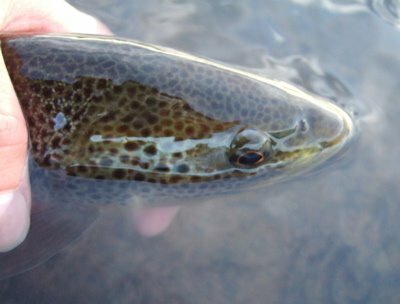 Suddenly I realised that the “t-shh, t-shh” of my waders was gradually replacing the trickle and fall, and everything felt instantly more quiet. 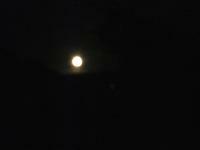 Over the shoulder of the hill the moon was gathering strength, by turns changing from misty red to a shining white. In the field my mind was in that special condition only afforded by a glorious evening’s fishing. I couldn’t help but remember one similarly wonderful evening last summer when everything fell into place. That night it was the spent BWO’s who took centre stage, and I’ve dreamt about gentle sipping rises almost every day since. Now there’s a new memory to sit alongside, more slurpy and bubbling, but still bathed in the glory of a summer afterglow. Nice report! It’s too bad the perfect summer evenings have to end. Yegads, and yet a half mile away there were no sedges – very strange ! A lovely post, your mojo is well and trully back Mike ! Thanks for the comments chaps. Glad you enjoyed the read.